TED Zine is premised on the idea of furthering TED’s mission: to share ideas worth spreading. 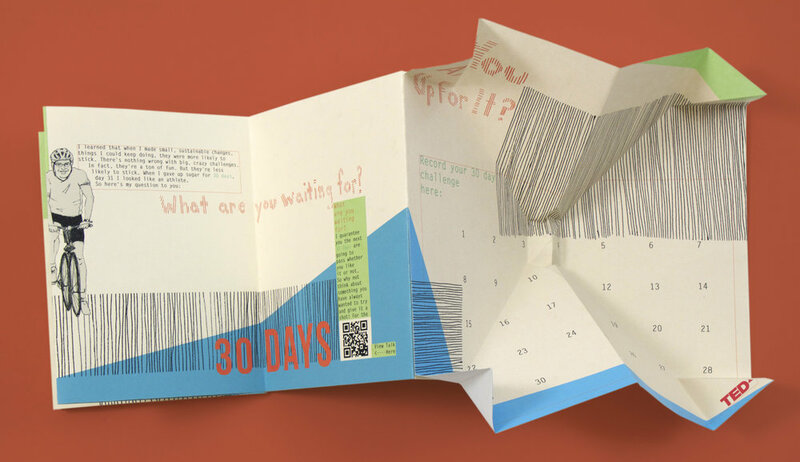 These three zines and posters are meant to be displayed in public spaces — such as subway stations — where people can take a zine and learn about a person’s talk at their leisure. Because of this, each zine is the width of a standard broacher, and posters are standard size for subway advertisements. The series displayed below is entitled Well Being. It features a talk on stress by Kelly McGonical, a talk on emotional well-being by Guy Winch, and a talk on a 30-day goal challenge by Matt Cutts.